With the calendar year coming to a close it is the ideal time to churn out statistical round-ups. While many are obvious - Ronaldo has scored lots of goals etc. 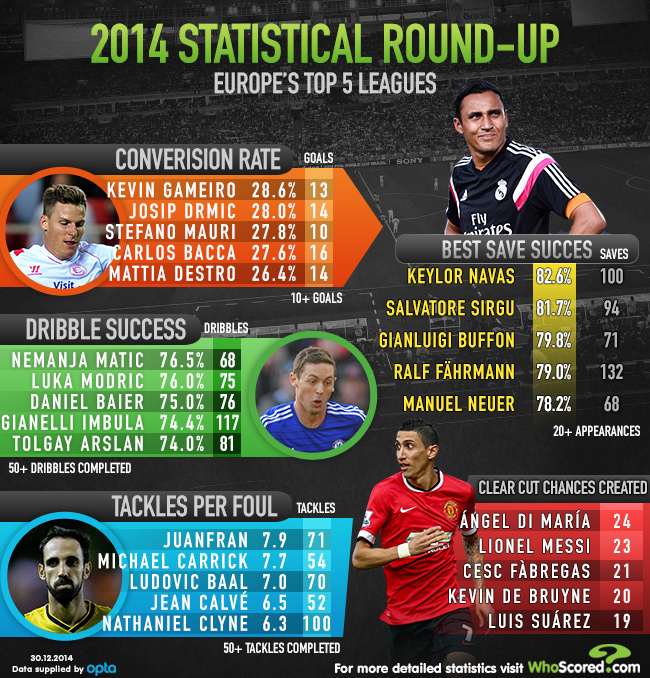 - and perhaps lack some context we've decided to look into five statistics that you perhaps won't have come across when it comes to the top performers of 2014. We start with an alternative on what most would consider the most important individual stat - goals. While Messi and Ronaldo continue to be just ludicrously good we're looking to those that have been most efficient in front of goal. Of all players to score at least 10 league goals in Europe's top 5 divisions Kevin Gameiro boasts the best conversion rate (28.6%). The Frenchman has become accustomed to playing second fiddle, first with PSG and now Sevilla, since making a name for himself at Lorient. Indeed, Gameiro has started just 2 games in La Liga this season but over the calendar year, despite being second choice for much of it, the striker still managed to notch 13 league goals, making him a more than capable stand-in for the Spanish outfit. Josip Drmic's move to Bayer Leverkusen may not have panned out as he would have hoped - linked to Arsenal before his inter-Bundesliga switch from Nurnberg - but the young Swiss still had an impressive year in front of goal. He's scored 14 league goals in 2014 with a conversion rate of 28%, just bettering Lazio's veteran captain Stefano Mauri, who has had a new lease of life this season to score 6 times in 2014/15, taking his tally to 10 for the calendar year. The fact that Carlos Bacca is in the top 5 goes a long way to justifying why the aforementioned Gameiro can't get a regular starting berth at Sevilla. The Colombian leads the top five here with 16 La Liga goals at an excellent 27.6% conversion rate, with Mattia Destro rounding off the leaderboard with a 26.4% conversion rate having struck 14 Serie A goals in 2014. There have been some standout, and in turn well documented, assist statistics this season, yet alone the calendar year, with Cesc Fabregas already having matched the leading tally from last season in the Premier League with 13 in just 18 appearances. We instead look to the players that have carved out the most clear-cut goalscoring opportunities, as defined by Opta, with a star-studded top 5. Manchester United's star signing Angel Di Maria leads the way having shone for Real Madrid at the tail end of last season, creating 24 clear cut chances for teammates in the calendar year for a return of 20 assists. He's one ahead of Barcelona's Lionel Messi - who managed just 14 assists in comparison - who in turn is two clear of former clubmate Fabregas (21). One player that the Spaniard could have been playing alongside this season had Jose Mourinho not deemed him surplus to requirements is Kevin De Bruyne, who has gone on to prove himself to rack up 20 big chances created for Wolfsburg, pipping Suarez into fourth with the former Liverpool striker managing an impressive 19 from just 27 league appearances. If you were given the clue that the best dribbler in Europe's top 5 leagues in terms of success rate was a Chelsea player the answer may seem obvious. It is, however, Nemanja Matic - not Eden Hazard - who comes out on top of those to have completed a minimum of 50 dribbles in 2014, beating his opponent with 76.5% of his 68 attempts, with his imposing frame able to fend off those that may challenge him. The Serbian beats another familiar face to the top, with Luka Modric representing the opposite end of the physical spectrum but still able to use his stature to his advantage. The Croat holds a low centre of gravity and his flawless touch has allowed him to ghost past 57 opponents' challenges this year at a success rate of 76%, just ahead of Augsburg's Daniel Baier (75%), who is another relatively diminutive customer. Marseille's Giannelli Imbula may be fourth in success rate but he is way out in front of the five in terms of the volume of dribbles he has embarked upon, successful with 74.4% of a notable 117 take on attempts. Meanwhile Hamburg's Tolgay Arslan rounds off the leaderboard with a 74.1% success rate having rounded an opponent on 60 occasions in 2014. Moving onto statistics that cover the defensive side of the game we look at players who have been exceptionally well-timed in the tackle. It's relatively easy to throw yourself into a duel with an opponent but also common to fell said rival when doing so. Those who get through a large quantity of tackles but commit very few fouls perhaps deserve the more credit and, of all players to complete at least 50 tackles in the calendar year, Atletico full-back Juanfran has excelled. The Spaniard has produced 71 tackles in total at an outstanding rate of 7.9 per foul having committed just 9 in La Liga in 2014. He edges out United's unsung hero Michael Carrick who has had to develop the defensive side of his game to enable him to drop into the backline on more than the odd occasion. The England international has produced 54 tackles and just 7 fouls for a rate of 7.7 tackles per foul. Lens full-back Ludovic Baal has been a busy boy this season as the newly-promoted Ligue 1 outfit strive to stave off the threat of relegation, producing 70 tackles in just 19 appearances with a tackle per foul rate of 7. Elsewhere in France's top-tier Lens' fellow newcomers Caen have an impressive tackler in their ranks, with right-back Jean Calve producing 6.5 tackles per foul, while Southampton's Nathaniel Clyne completes the top five having produced 100 tackles in the calendar year - with 78 this season representing a league high - and committed just 16 fouls (6.25). It wouldn't be right to overlook the goalkeepers either so rather than look at the tally of saves a shot-stopper has made - skewed largely by the team for which they play - we look at save success rate. That's the percentage of shots on target faced that they have managed to keep at bay, considering only the No. 1s who have made at least 20 league appearances in 2014. Keylor Navas certainly shone in the calendar year for both club and country and his outstanding form for Levante earned him a move to the Bernabeu and Real Madrid. The Costa Rican managed a save success rate of 82.6%, producing 100 in total, to lead the way from PSG's Salvatore Sirigu, with the Italian producing 6 saves fewer for a success rate of 81.7%. Gigi Buffon continues to roll back the years with the dominant Serie A force that is Juventus, boasting a 79.8% save success rate but having been forced into just 71 saves. Schalke's Ralf Fahrmann, meanwhile, has produced a hefty 132, making his success rate of 79% all the more commendable, while elsewhere in the Bundesliga Manuel Neuer's figure of 78.2% goes some way to explaining his deserved inclusion among the Balon d'Or finalists after a sensational year for both Bayern and World Champions Germany. Some unknown name like Baier should not a suprise. He is fc augsburg one of the top players since the time they have put a foot in bundesliga. Plus this list for the time being should tell everyone that salvatore sirgu is top keeper and he makes lot saves despite being under cover supposedly good defenders. he is better than both courtois and de gea no doubt abt. Just becoz they play in a English league that is being watched by morons does not make them than Sirgu. Neuer dont even think abt these two are Neuer and neither they will be. You see Buffon is still going strong. And i doubt De Gea and Courtois even better old man Buffon as of right now. Good thing that this list put the end to this myth. Keylor Navas was very good in this year,maybe in ” Top 3 Best Goalkeepers ” of the season,at the WC he was a crucial player for his team...a true leader ! @AndreyNosatii very true and plus im suprised to see Ralf Fahrman in the list. I thought he conceded a lot with schalke 04 but maybe im wrong.